We offer specially designed Yoga, Breathing, Meditation and Mindfulness Courses. We also run Breath Workshops using a powerful method called the Buteyko Method which is known for its therapeutic effects on Asthma, Insomnia, Anxiety, Sleep Apnoea, Respiratory problems, and many others. Core and Back Strengthening with our short routines. Mental health – Meditation as a tool to increase self awareness and stabilize the mind and emotions. Yogic breathing techniques – for Balancing, Energising, and Calming the Nervous System. The Buteyko Breathing Technique – According to scientific research by the famous Russian doctor K.P Buteyko, most modern day illnesses from Asthma, Diabetes, Hypertension and Insomnia to name a few, stem from over-breathing. This technique is used to normalize the breath. 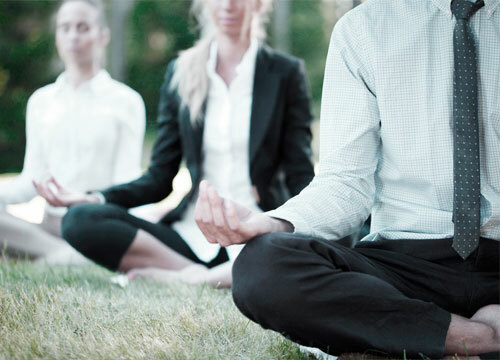 Mindfulness training – We offer courses on mindfulness. This includes powerful breathing and cleansing techniques that help one to energize, cleanse and rejuvenate. Simple backbends, Twists, Forward Bends, and passive Inversions to relieve tension that may have accumulated during the day. To energize, release endorphins, gain spinal flexibility, improve blood flow to brain and upper body. Postures to gain flexibility in the lower body, free energy or life-force in the hips, pelvis and groin area. The core is the powerhouse of the body and as we age, muscles of the core tend to lose their tone compromising our health in many ways. Sitting at a desk all day long can cause 4 times as much compression, which then leads to back problems, stiffness and degeneration of the spinal discs. To alleviate back, neck and shoulder tension. Techniques to help one de-stress through simple stretches. Eye exercises for those who sit in front of computers for prolonged periods. Simple yet effective relaxation techniques to address deep rooted tensions that may have been lodged in he body over a period of time. Deep within us there are knots of tension that can give rise to disease, stress, irritation, anger and the lack of clarity. Learning how to relax is an art that is indispensible for the well being of the body, mind and emotions. Effective to help normalize breathing and through it cure health problems ranging from Headaches, Constipation, Irritable Bowel Syndrome, Gastritis, Acid Reflux, Insomnia, frequently occurring Colds and Coughs, Lethargy, Sluggishness, inability to Concentrate, Weight gain, Anxiety, Skin problems among others. Important tips on diet and nutrition that can help one make healthy choices while at work.